PLOT SUMMARY: The election is finally over. President Frank Underwood (Kevin Spacey) won Ohio and thus the election against Republican candidate Will Conway (Joel Kinnaman). Conway's old campaign manager Mark Usher (Campbell Scott) is appointed Special Advisor to the President replacing the Underwoods' former campaign manager Leann Harvey (Neve Campbell). 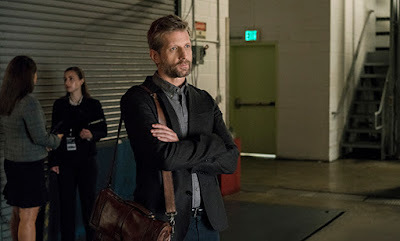 The Vice President Claire Underwood (Robin Wright) sacks speechwriter Tom Yates (Paul Sparks) but still wants to see him. The Underwoods are using Jane Davis (Patricia Clarkson) to assassinate IT specialist Aidan McAllan (Damian Young) and know this will put them in her debt. Journalist Kate Baldwin (Kim Dickens) goes to Russia to interview Aidan and tells him that Leann has been forced out of power. He calls her and tries to persuade her to come to Russia but she refuses and tells her people are coming to assassinate him. However, Jane and the Underwoods are actually taking him to Jordan to be interrogated. As they are about to attend the White House Inaugural Ball, Frank's creepy personal trainer Eric makes a move on him and Frank quasi-threatens him in return. Chief of Staff Doug Stamper (Michael Kelly) escorts him from the ball. Separately, a scorned congressman says he's going to attempt to resurrect the Republican's investigations into the Underwoods. Frank warns Tom Yates not to cheat on his wife. White House Press Secretary Seth Grayson (Derek Cecil) tries to contact Tom Hammerschmidt (Boris McGiver) but fails. Tom now has the video tape of the moment Frank killed Zoe Barnes in a metro station but the evidence is inconclusive. Tom calls Zoe's father but he doesn't want to get involved before turning up at Tom's office. COMMENTS: A holding episode at best. It's hard to ignore the suspicion that it exists merely so that series creator and episode writer Beau Willimon could give Frank a breaking the fourth wall speech chiding the American voters for electing Trump. Otherwise, from a narrative pacing point of view one would've picked up a few months into the new administration.